Is the Milky Way larger than we thought? Nearly a century ago, Harlow Shapley measured the distribution of globular clusters around the Milky Way to determine that it was roughly 100,000 – 150,000 light years across. Over time we’ve gotten a better measure of the Milky Way, which gives a diameter of about 100,000 light years. Now a new paper in the Astrophysical Journal shows we might have to revise that size back up to 150,000 light years. The Monoceros ring around the Milky Way. The 100,000 light year diameter we usually state as the size of the Milky Way comes from observational evidence that the number of stars dramatically drops off once you get to about 50,000 light years from galactic center. That doesn’t mean there isn’t anything beyond that point. In fact in 2002 the Sloan Digital Sky Survey found a filament of stars about 60,000 light years out that wrapped around the Milky Way. This “Monoceros ring” as it came to be known was thought to be separate from the Milky Way because of the gap in stars and its diffuse nature. 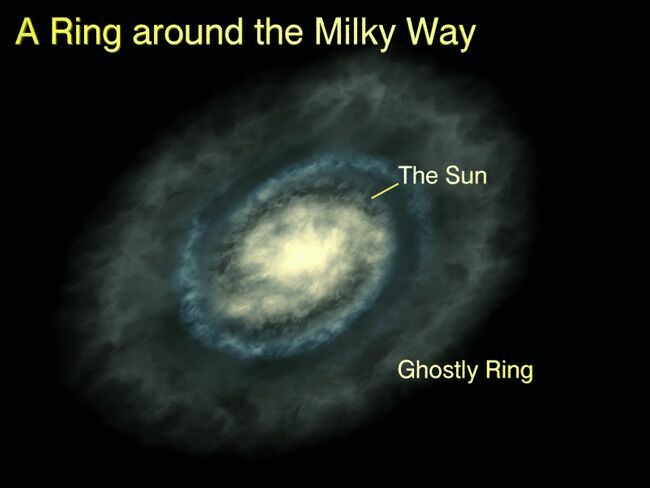 But further analysis of the data hinted at a connection between the Milky Way and its surrounding ring. In this latest work, the team reexamined the SDSS data and found the gap was actually a ripple in the distribution of stars. They found three other ripples within the Milky Way closer in, which seems to show a connection between them. If the Monoceros ring is structurally part of the Milky Way itself, then the diameter of our galaxy would be closer to 150,000 light years. This particular work doesn’t prove conclusively that this outer region is connected to the spiral arms of our galaxy, but other work has shown that the arms extend further than we’ve suspected. What’s more interesting is the strong evidence for this rippling effect within our galaxy. You might remember an earlier post where models of such ripples could be due to localized clumps of dark matter. Its possible that these ripples could help create a more detailed map of dark matter in our galaxy. What is clear is that this work has given us a better understanding of the shape of the Milky Way. I wonder how this affects the thickness of the Milkyway. Do we see similar structures in other galaxies?